Charles Ogilvie is a London based multimedia artist and graduate of the Royal College of Art who has completed a PhD by practice at Oxford University exploring outsider art and outsider science. The collaboration between Dr Daniel Crow, physicist and Dr Charles Ogilvie, artist, began at the Royal College of Art in 2010. The Royal College of Art and Imperial College had arranged an art/science “speed dating event” to aid postgraduate students in finding potential collaborators. 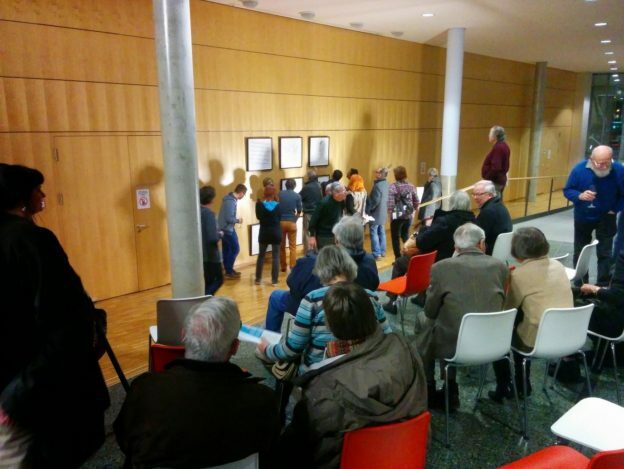 The event extended across fine and applied art and was attended by several hundred students. It was to be a problematic evening: RCA graduates had a sprawling range of expectations, from finding inspiration for a new piece of video work to looking for technical assistance in material science or software projects. Several ‘dates’ into the evening, it became clear that many of the scientists were as confused as the artists as to what the event was offering. Charles recalls that a few of the scientists trying to convince him to ‘make’ their idea: ‘I’m studying these cells and I think their shapes would make a great mobile’. It was in this context that the collaboration began. A few minutes into their ‘date,’ Charles and Daniel decided they’d had enough. Instead, they would go to the bar and have a beer by themselves. This somewhat frustrated response to the huge catchall of Art/Science collaboration helps to contextualise their early projects together as we will see. Daniel’s work at Imperial involves the theoretical modelling of quantum nanoscale systems to probe the physics of high temperature superconductivity and the solving of these models on the Imperial HPC cluster. Each step of the process – understanding the quantum effects, working through the algebra, and then computationally solving the model – is complex and highly abstract. Unlike fields such as biomedical science or astronomy, which produce plenty of visual material, or those which offer quasi-intuitable reasonings to the outsider, both the concepts and languages in Daniel’s research are deeply specialised and arcane. The terminology, while often apparently meaningful to the non-specialist (i.e. ‘supersymmetry’) in fact signifies a concept that has little to do with the layman’s sense of the potential meaning. This un-intuitable material is directly relevant to the main enquiry behind Charles’s practice, which focuses on exploration of how individuals make their own sense out of concepts and systems too complex to intuit. 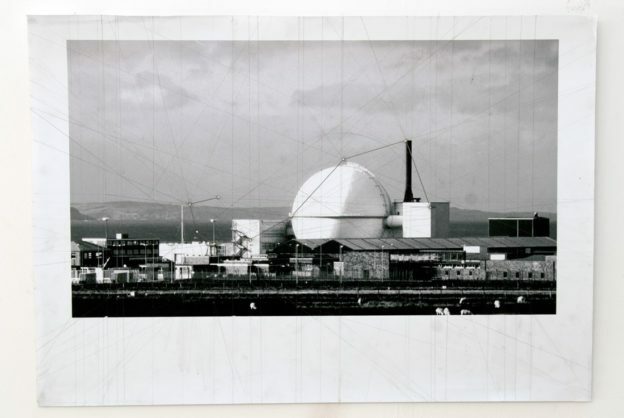 Charles was on a two year MFA in the Sculpture department in which he had been developing a body of work focussed on the huge and mysterious sites of the British civil nuclear fleet, imagining them as a constellation across the landscape to be deciphered, perhaps astrologically. The encounter with Daniel and subsequent focussing of his enquiry into complex science and pseudoscience systems has led to a PhD by practice at the Ruskin School at Oxford University. The first work produced by the collaboration was made for a show of art-science collaborations at the Blythe Gallery in 2011. 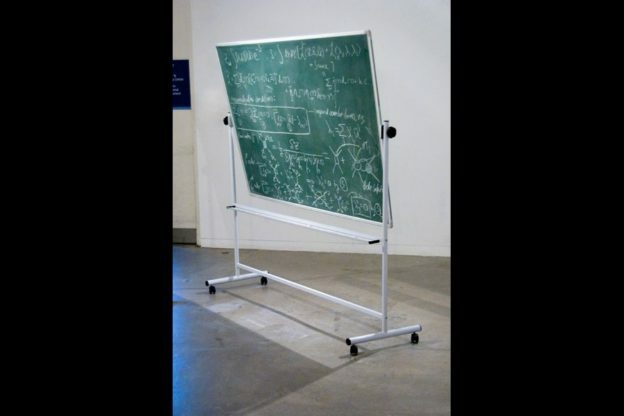 The work was titled The Renormalized 4-Vertex at one-loop and drawing of The Renormalized 4-Vertex at one-loop by the artist (see reverse) and consisted of a double sided green institutional blackboard with equations written on both sides. The work had been developed out of the experience of the art science speed date and the subsequent frustration felt by both participants that these projects were all too often illustrative, or lacked a real engagement with the concepts at the heart of the science and those within the art practice. An element of Daniel’s research (given in the title), has been represented by the scientist on one side of the blackboard, and the artist had made a drawing/copy of it on the reverse. As such the work was about the illustration of science rather than engagement with it. As the artist could not see both sides simultaneously, his ‘drawing’ is full of errors, however in the gallery setting it is the side on display, facing the room and picked out by the spotlight. The work was at once sculptural and conceptual, and as a critique of the largely illustrative works that surrounded it in the gallery. Their conversation about illustration vs engagement expanded over the following two years, resulting in a work catalysed by press coverage of the discovery of the Higgs boson. Charles had been collecting press cuttings and with them, a ballooning set of metaphors latched onto by journalists trying to explain the science behind what was clearly a news-worthy endeavour. After several months of coverage, the Higgs discovery had transcended the narrow world of physicists who understood at least some of what it was and what its discovery meant. The rest of society, however, was left with a sense of wonder and semi comprehension on the back of tenuous metaphors of ball bearings in grease or trays full of ping pong balls. For Daniel, this dichotomy was clear to see: the reality of the science being done and the specific phenomena and theories it was interrogating vs. a blurred image of the project reflected in newspaper articles and non-expert commentary. Charles and Daniel developed this work out of the humor as well as the frustration of this reflection. What would the simplest, coherent and correct description of the Boson look like?, Charles asked, how far back do you have to go in explaining physics to arrive at a departure point for a derivation of the boson that does it justice? Reflections on the Higgs Boson developed out of this conversation and consists of five foolscap etchings, laid out like the pages of a science textbook. 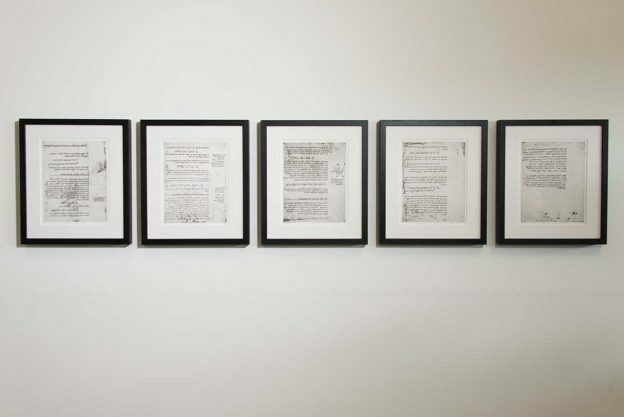 On them the derivation is written out in the style of an undergraduate textbook and reproduced through the printing process in a mirror image. Even without this inversion through, this ‘primer’ in Higgs would be undecipherable to 99% of the gallery audience as, starting from an undergraduate level of physics, it is still far too advanced to be accessible. As Charles pushed Daniel towards an acceptably ‘correct’ but also widely ‘intuitable’ explanation – it became clear that to the specialist (Daniel) there was no neat metaphor or non-mathematical sketch of this phenomenon that captured anything like enough of it to be useful, or even illustrative. The Higgs exists in three spaces: the real world as the name of a phenomena that we are still only starting to understand; in physics where its meaning is deeply specific, and relates in complex ways to other, often precarious, theories within the ‘Standard Model’; and within culture as an idea and event, perhaps as a triumph of international scientific collaboration and a token of British intellectual status. Like the journlists metaphorical ball bearings, there is little concrete that binds these three Higgs together. Unlike many things which share a number of such spaces, the work explored, in the case of Higgs, how dislocated they are. The original plates were carried around by Daniel as he put together the text and graphs; the wear and tear is apparent, giving the plates scratches and speckles that echo the swirls and starbursts of the detectors at the large hadron collider where the Higgs was detected and reminding the viewer of the solidity and weight of the printing plates; a mass perhaps imparted by the Higgs itself. 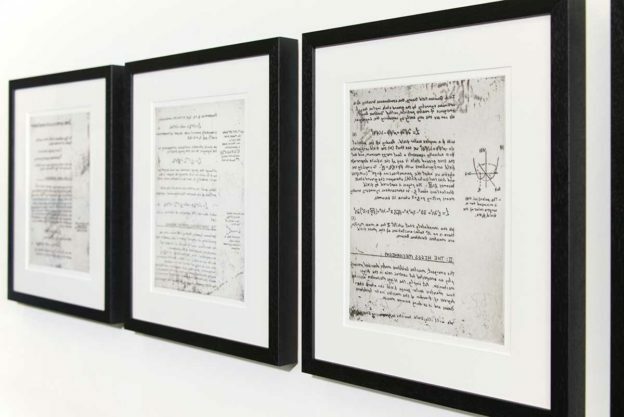 As art objects, the pleasing aesthetics of the etching plate and the wink towards the genius of Leonardo who wrote his notebooks in mirror writing only heighten the gap between the typical gallery viewer, and the hidden meaning not just below the surface, retrievable with a mirror, but hidden behind years of study. In late 2014 while Daniel was conducting research at the Max Planck Institute for the Physics of Complex Systems in Dresden, the pair were invited to make a new work for the atrium. Visiting the Institute, Charles was struck by the curious eclecticism of the community there. Unlike most physics departments where buildings will typically be filled with scientists and mathematicians with adjacent subject matter, the MPI instead welcomed advanced researchers from across the biological, chemical, and physical sciences who were using particular kinds of complex mathematical modelling in their research. The open plan architecture of democratically repetitive small offices that made up the bulk of the building was adorned, as with many science departments, with the large, plotter printed posters used by scientists to illustrate recent research. These vary wildly in graphic design ambition (and success) and can range from an A0 sheet of mainly text and equations to lavishly gloss printed images, clip art with overlapping borders, and pop out boxes. What was clear from the corridors and corridors of posters was the wildly eclectic subject matter being studied at this institution. A shared desire to solve certain kinds of complex mathematical problems underpinned all the seemingly disparate goals of the work: the cell formation in a butterfly wing might be next to an exploration of particles at the big bang. Spending some time in the corridors of the MPI, the pair noticed another effect. 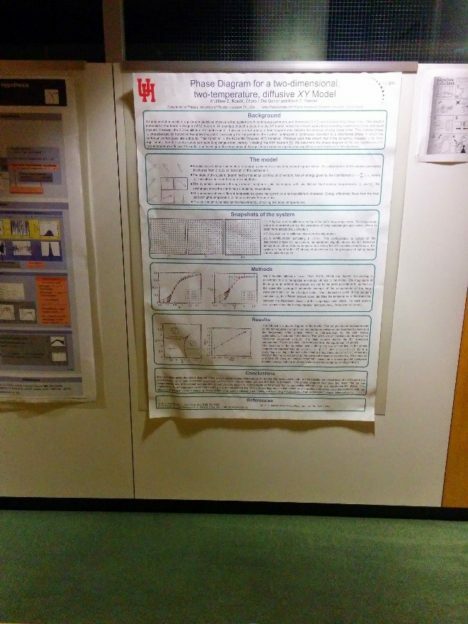 Groups of researchers would gather around a poster, not as in a typical department to critique familiar work, but in a spirit of friendly rivalry, trying to understand often deeply unfamiliar material. The posters were like puzzles which had to be deciphered before they could be academically related to. Whilst the curiosity and conversation sparked by this adjacency of an otherwise unrelated diaspora of complex systems mathematicians was undoubtedly one of the intentions of the MPI, it was the sheer pleasure in tacitly competitive problem solving that struck them immediately and became the kernel of the work Circling the Square. The work is a puzzle, and was clearly advertised as such through a notice in the exhibition space and through a webpage, set up to allow a wider pool of mathematicians to compete: http://charlesogilvie.co.uk/portfolio_page/circling-square/. The prize is a trip to Bletchley Park, the home of UK code cracking, to have tea with Charles and Daniel. Charles and Daniel decided that the work needed to have an element of decipherability to be at home next to all the posters and moreover that such a competitive element would be a generous gesture to a community of problem solvers. The three by three layout of the puzzle came through a discussion about the centrality of the matrix to many disparate parts of applied mathematics with Charles enjoying the wider associations of the word and the associated glossary of terms ‘determinant’, ‘root’, ‘monotone’, etc. which might play into the solving of a word/ number puzzle. Charles and Daniel met several times once the basic form of the work had been agreed. Each iterating their own contribution; Daniel producing the mathematical/ physical elements and Charles the verbal/ images. 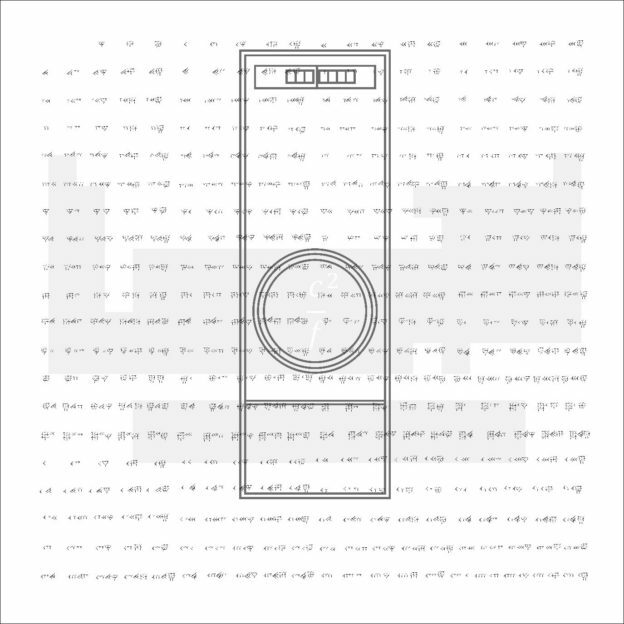 Each cell has a number of layers, with a missing number puzzle in a number of ancient number systems, a solvable physical function (often also functioning as a pun on the name of the operation) and a visual ‘rebus’ or other decipherable image puzzle. As each collaborator developed their content they looked for possible links to the other, for example as a 3 x 3 grid of letters developed, those that could also function as physical functions became folded into Daniel work and when numbers or relationships appeared in Daniel’s they were absorbed into the visual and verbal layers. Unlike some cryptographic public art where the puzzle is earnest and ‘complete’ as a cryptography problem, inviting rigorous solutions from specialist code crackers, Circling the Square is full of dead ends, bad puns in both English and German and sometimes childish associations. The graphical quality of the work echoes the posters on the wall of the institute: vector and clip art greyscale. 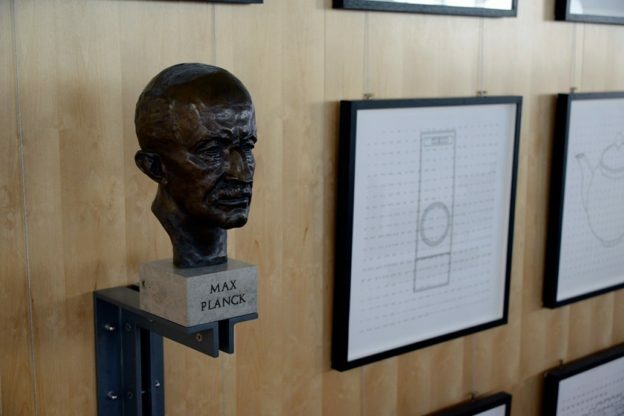 One of the ‘cells’ is replaced with the ubiquitous (to Max Planck Institutes across Germany) bronze bust of the man himself. This object features in the solution of the puzzle both as the mathematical function MAX, the numerical value of Planck’s constant as well as its signifier ℏ. The earliest 3×3 letter puzzles were found in ancient Egypt, leading Charles and Daniel to riff on this with the inclusion of hieroglyphic counting and egyptian fractions, riddling like the sphyx. 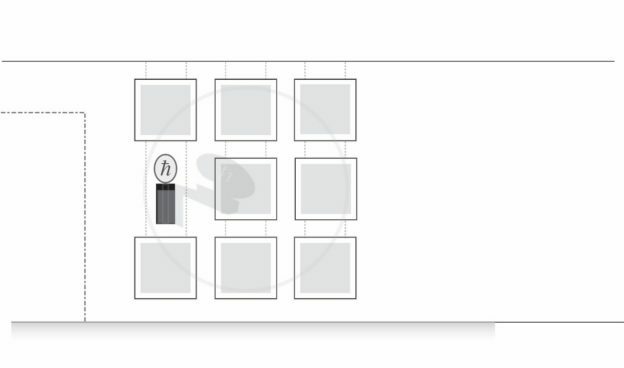 The images themselves are layered in different shades of grey so the compositional emphasis changes as you approach the work, revealing new details essential to solving the puzzle. Whilst there are elements that can be solved by the layman: visual jokes and word games, like the science being done at the institute there are other elements that will require time consuming analysis and specialist knowledge, and there are several ways to the solution so you can only be really sure you are correct if you land there a few different ways. The name of the work refers to the ancient conundrum of geometrically constructing a square with the same area as a given circle. In this case it is reversed to imply circling around a solution that might be involved in approaching this particular square (the grid also contains a faint embedded circle with its equivalent area). The pair have received only three submissions (all incorrect) to date. 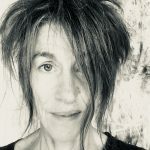 The work raises the parallel question of whether works of art can be ‘solved’ and how galleries and curators have fed this understanding through the way works are presented, with gallery texts and press releases ‘explaining’ what the work is really about. The most recent completed work in the collaboration has been the animation project The Principles of Collision. Charles had been asked to make a video work for a presentation at the Society for the Humanities at Cornell University in collaboration with the composer Steven Potter. The work evolved out of a discussion about the intersection of minimalism and physics in the 1960s, and about the Feynman Diagrams. These were by the physicist Richard Feymnan in this period to help describe subatomic particle interactions which have an aesthetic overlap with the avant-garde musical scores of his contemporary John Cage. The diagrams had featured in the Renormalisation work as part of Daniel’s research. Feynman had been invited to Los Alamos to work on the Manhattan project. He writes that as the accommodation had yet to be constructed, they lived in tents, but were each given a blackboard. These eminent scientists would walk around this building site, wheeling their blackboard b . 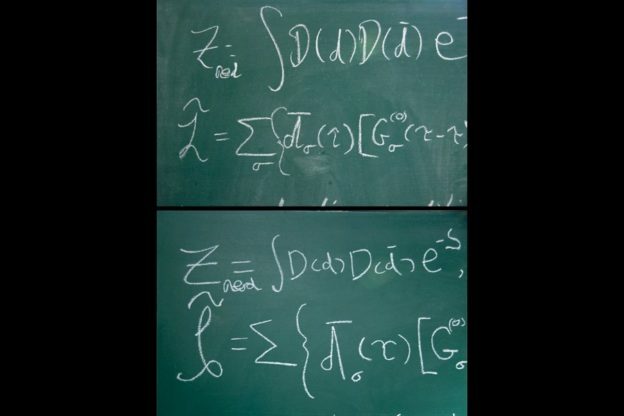 The chalkboard is also an art trope, indeed the spiral across Sunstate, one of Beuys’ blackboard works, suggested the spiralling trails of the cloud chambers that detect the particle collisions in reactors like the LHC. 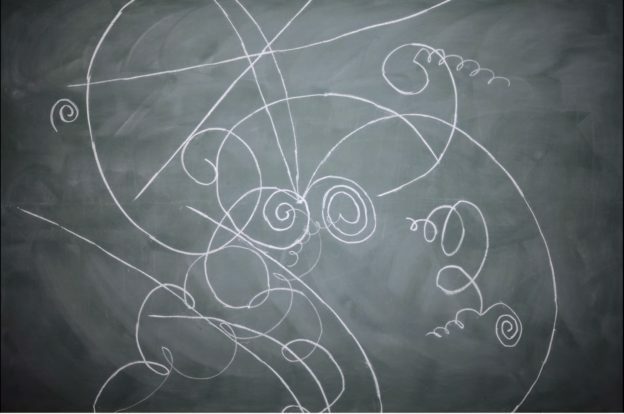 The Feynman diagrams themselves (invented later) are a curious artifact. One can learn all their rules without understanding anything about what they mean. This dumb learning-by-rote became the basis of the new work, a stop frame animation hand-drawn on a blackboard: The Principles of Collision. 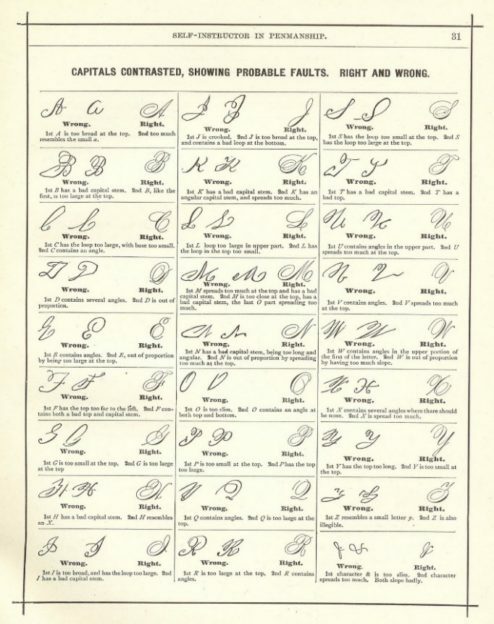 The work also draws upon the dumb rote learning of Victorian calligraphy manuals which send the chalk swerving round the board like the particles in the collider . The ‘script’ was developed around a real set of physics interactions culminating with the collision of two particles in the reactor chamber of an accelerator such as that at CERN. The dreidel-like hexagonal prism object is a rendition of this chamber. Like the puzzle work Circling the Square, the work was developed in layers, first a structure agreed: a series of interactions which are illustrated in various ways by the film. Charles developed the pedagogic dialogue using edited text from the calligraphy textbook and primers on Feynman diagram construction.whilst Daniel developed a progression of the diagrams, consistent with the ‘principles’ and the series of interactions. The final script and storyboard were tweaked iteratively by the pair before and during capture of the many thousands of frames photographed in the studio. 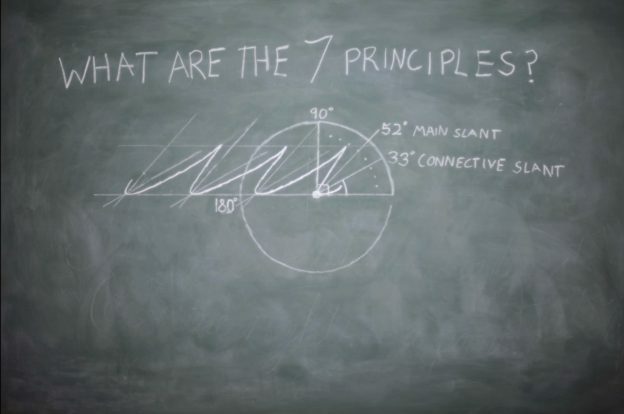 Hence, as it ‘teaches’ the principles, the work tracks a development of ideas amid the floundering comprehension of the ‘pupil, as the actual physics is taking place in the background. The music was scored as a series of adapted Feynman diagram and performed live for the event at Cornell. 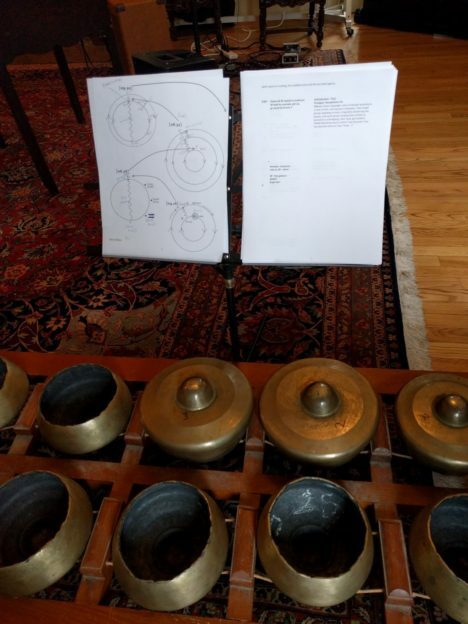 The instruments and format were dictated by the composer but are drawn from the same palette of 1970s cultural tropes: the ensemble consisted of the resident Cornell gamelan enthusiast who, along with the composer, Steve on the ‘prepared piano’, joined a cellist and violist. The musicians were ‘conducted’ by a clock which, as well as being an appropriately dated Cageian conceit, usefully allowed for exact timings over the animation. The strikingly retro ensemble and musical arrangement seemed appropriate to the subject matter. The diagrammatic musical score relates to the underlying physics in the animation. Structures in the music resolve themselves over different timescales or frequencies, echoing the different ‘order’ Feynman diagrams used in the animations. The scientific, calligraphic, and musical elements of the work struggle to comprehend each other as each builds its own apparently rational rules, developing through the piece. In counterpoint, classroom physics snooker balls collide, chords change, script develops in complexity, and finally the LHC is switched on. Nothing is learned other than some sense of shared endeavour. There are scraps of shared languages: familiar terms like ‘frequency’ or ‘energy’ seem to speak of common ground. 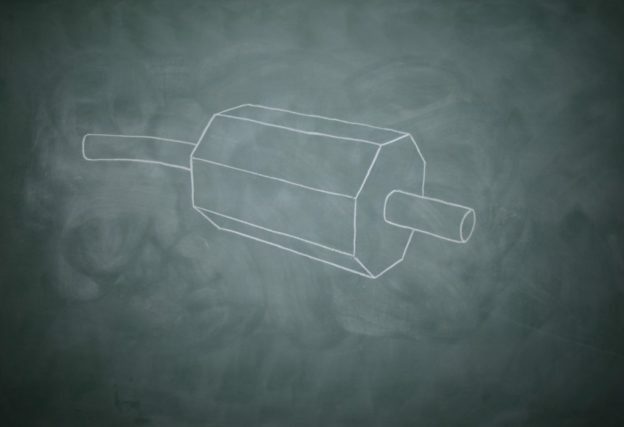 There are familiar modes of representation: the line and point, the chalkboard and dialogue. But for all the cunning conceptual architecture and aesthetic wit, the work, like the Higgs etchings, reveals an emptiness. Can we really say that knowledge has been transmitted, or if a shared understanding really earned? Charles and Dan have discussed this gap in understanding between a specific scientific comprehension and the vaguer cultural sense of recognising/ grasping an idea. In the animation they wanted to expand this critique to the ways of building systems and the lazy synchretism of drawing parallels. So seductive is much of the complexity of science, especially when it offers the keys to vast projects like the LHC, that wider culture can fall into an awestruck orbit of it. In that orbit finding connections with something readily intuitable, like snooker balls or handwriting, is reassuring and can produces an accretion of seductive yet ultimately pseudo-sensical sentiment. In a wider sense perhaps, many intersections between complex self contained systems, both intellectual and cultural, are ultimately rewarding only as a pattern spotting pursuit, evolving some sense of common ground between groups and offering a glimpse of a reassuringly interconnected of the universe?